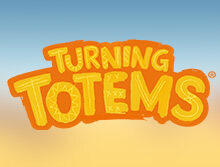 You will love this 5 reels and 11 payline slot game called Turning Totems. It has been brought to you by Thunderkick, the popular game development company. It is a game with attractive graphics, in keeping with the high standards of Thunderkick. The theme for this slot game is Native America, and it is set in desert-like surroundings. If you have any exposure to Native American culture, you will recognize the totem pole. You will also know that the stacked wooden pole called totem pole is a very integral part of their culture. 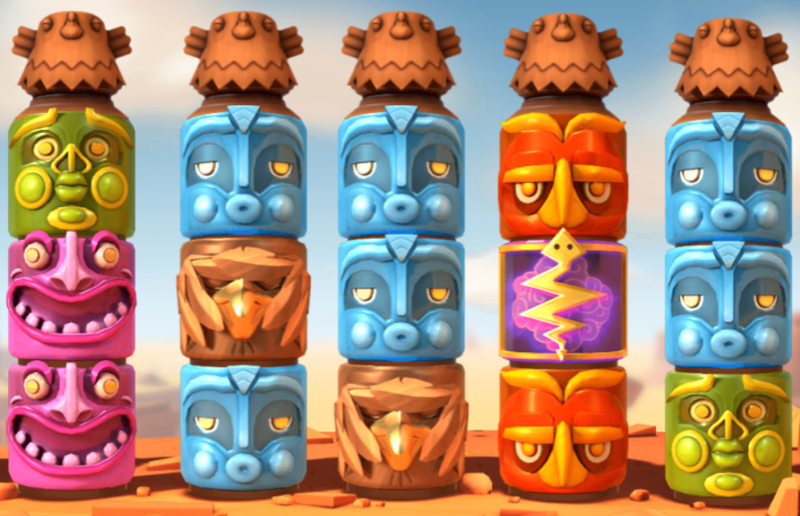 And the totem pole is imaginatively used in this game to highlight the 5 reels you would be playing on. Each of the 5 reels has three rows, and each row is represented by one part of the pole. You can start off playing with 10p spins, and as you grow in confidence, you can go up to £100 per spin. This game can be played across all devices, including desktops, tablets, and of course on smartphones. The bonus features are also slightly different from usual slot games. Overall, the expected return to player (RTP) rate can be 96.10%, which means that you can expect reasonably good returns when you play Turning Totems. There are a few small tweaks in this slot game. For example, the paylines could be formed from left to right as well as right to left. Also, the number of symbols is quite less. There are not too many symbols in the game, and further differentiation is possible only by using more colors on similar symbols. The five colors used are yellow, red, pink, green, and blue. The differentiation between two identical symbols can be done on the basis of colors. You will love the look on the symbols which would remind you of ancient architecture. There are rocks and cactus in the graphics which give you the look and feel of a desert landscape. There is a Native American on the screen, towards the left of the reels. The look and feel of the Turning Totems is a huge improvement on the already high standards set by Thunderkick. The sleeping totem is the Wild symbol of this game. It can be used to replace any other symbol during the game, except for the Scatter symbol. When this happens, a respin is made available. When the re-spins are happening all the sleeping wilds turn into wilds on the thunder reel. The thunder symbol also plays the role of the scatter symbol in this game. By itself, the scatter does not provide any payouts, but it only transforms the reel (where it lands) into a Thunder Reel. When you get 3 scatters in any 3 positions on the reel, the bonus segment gets triggered, about which we will elaborate later. In this game, the sleeping wilds are regular symbols with lowest returns till the time they land on a thunder reel. Thunder Snake: This is a symbol which can come on any of the rows of any of the reels. On whichever reel it falls, the reel gets transformed into a Thunder Reel. As soon as this happens, the particular reel becomes a Thunder Reel. The symbol exactly above it turns golden and assumes a 3D look. All the sleeping wilds on that particular reel get activated into Wilds, and you get one free spin. Bonus Game: If the above happens simultaneously on three reels, and 3 Thunder Reels are formed, then a bonus game gets activated. You will get five free spins when this happens. All the Thunder Reels thus formed stay active throughout the duration of the bonus game. This results in all the locked Wilds becoming activated on all those Thunder Reels. If more snake symbols land on the thunder reels, more extra spins are awarded to you. This can go on till you get a maximum of 7 extra spins. On an average, you can win from 120 to 180 times your wager amount. Some players have reported gains of 300 times the bet amount. The game has medium to high variance. You must be wary of the dead spins eating into your money, so try getting the thunder back into the reels as often as you can. Apart from the opportunities to win big, you will also love the animation and graphics on this game. You do not need to worry too much about the fairness of this game since it has been duly audited and certified as well. Some players have expressed the opinion that the paytable for this game is pretty low, and it is more suitable for games with 243 ways to win. But it is good for entertainment and moderately interesting returns without too much of risk.